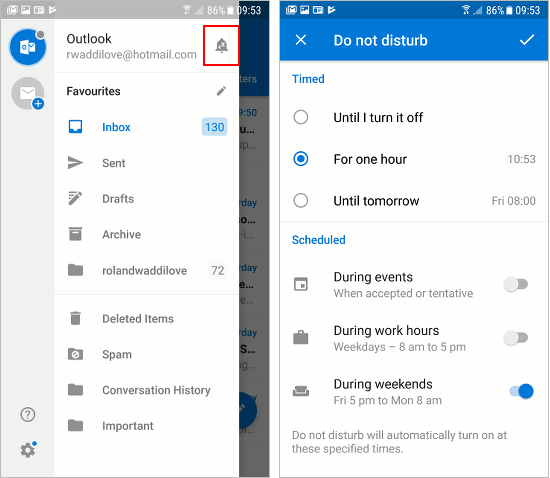 Don’t let notifications bug you when you are busy, configure Outlook on your Android phone to show notifications only when you need them and schedule quiet times free of distractions. 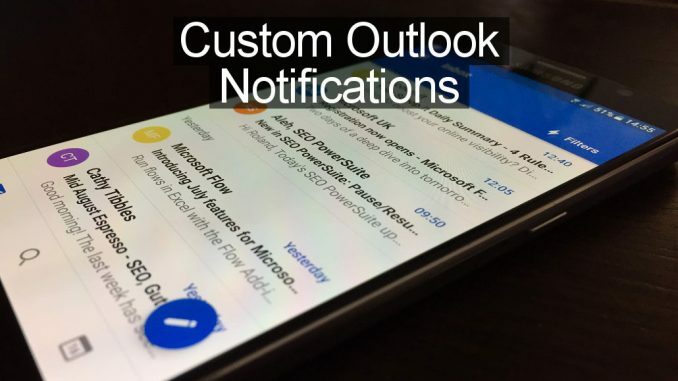 Sometimes you don’t want to be disturbed by email notifications from the Microsoft Outlook app on your phone, such as when you are in a meeting at work. The sounds and the screen lighting up can be distracting. You might not want work emails to bug you at weekends when you are supposed to be relaxing and you certainly don’t want to be pestered in the middle of the night by emails that can wait until the morning. A good night’s sleep is essential if you want to be productive the next day. None of these options is perfect and you might forget to enable them and then be disturbed by notifications in your meeting, in bed or relaxing at the weekend. There is an alternative way to silence these distractions that you might prefer. I will be using the Outlook app on an Android phone, but these features will no doubt be incorporated into the iPhone app sooner or later too. Open the Outlook app on your phone and tap the menu button in the top left corner to open the sidebar. Press the bell icon at the top. The Do not disturb screen is displayed and you can use the controls to choose when to display or hide email notifications. When you enter a meeting you could turn off notifications for one hour, or until you turn off Do not disturb. However, there is a better solution. If you schedule events with Microsoft Calendar (it’s in the Outlook app, in Windows 10 and on the website), turn on the switch During events and notifications are automatically muted for the duration. That could be a useful feature and it saves you having to remember to manually turn off notifications. There is also a useful option to turn on Do not disturb during weekends and you will not see any work emails from Friday 5 pm to Monday 8 am. Now you can relax without worrying about work. It does not mean you will not receive emails, you will and you can manually check for them by opening the app, you just won’t see or hear notification sounds and notices. 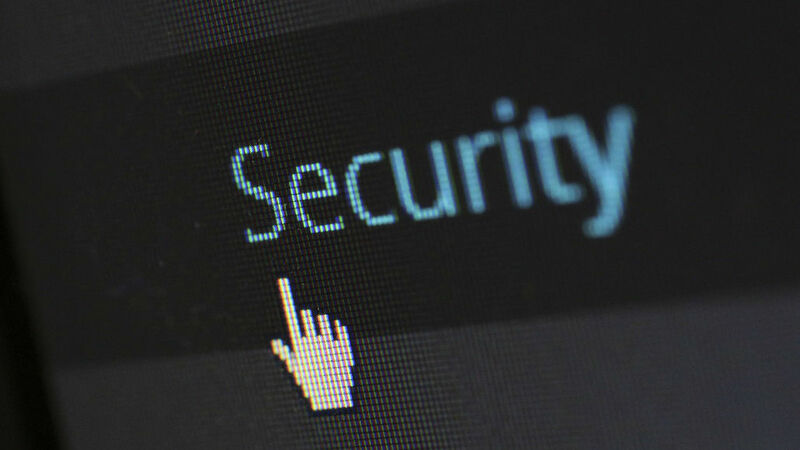 Set the options as you prefer and press the tick button in the top right corner. There are more notification settings elsewhere and these allow you to configure additional options not available in the app. Go to the Settings app on your phone and press Apps. Find and press Outlook to show the Application Info screen. Scroll down a bit and then press Notifications. 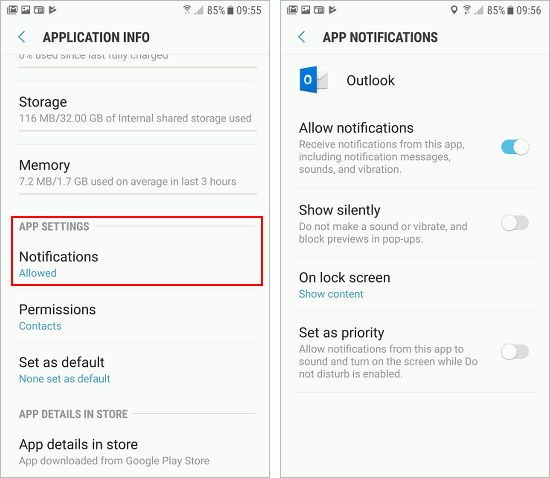 These are Android notification settings and they are not specific to any one app. There is a master switch at the top, Allow notifications, and this shows or hides all notifications from an app. There is an option to show notifications, but disable sounds and vibrations – Show silently. If your emails are private and you don’t want anyone who picks up your phone to see them, press On lock screen and select Hide content. If you are not bothered if people see the subject and first few words in a lock screen notification, set it to Show content. This doesn’t work on the current version. There is no bell icon to tap.